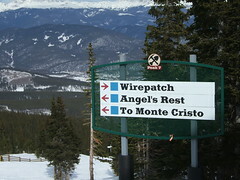 Vail Ressorts Inc. run some of the greatest ski areas in the Rocky Mountains. PlayersPrayers tested three of them. Beaver Creek, Vail and Breckenridge all offer outstanding winter sports facilities. But what about spiritual guidance for skiers and snowboarders? 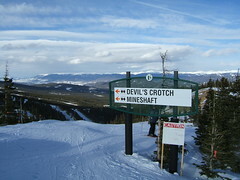 Beaver Creek does not offer a single slope with religious implications. 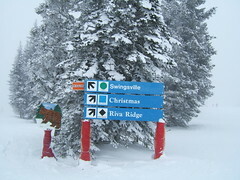 Vail at least has a "Christmas" slope which is quite poor for the largest ski resort in the U.S..
1. "Angels Rest" is a more difficult trail which is extra wide and although you of course head downhill you really feel like flying in the heavens. 2. 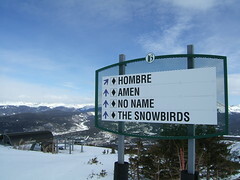 "Amen" is not just a good ending for every prayer but also one of Breck's most difficult trails. 3. Unfortunately we are not able to offer a photo from "Trinity" because lifts were closed due to hazardous avalanche conditions. "Trinity" starts as a single trail (unity), then splits up into two. From one of these two another branch emerges just as the holy spirit is confessed to proceed from the Father and the Son to complete holy "Trinity". Trinitarian thinking and skiing that rail both require expert skills. Not counting for the stats but good to know, too: On the North Slope of Peak 9 there are the most evil slopes: "Devils Crotch" followed by "Hades" and "Inferno" and a bit more downhill "Satans".